Phill Sykes of Sigma Sport Specialized racing team has won the 38th edition of the Severn Bridge Road Race, sponsored by Felt Bicycles and organised by Bristol Road Club. He outsprinted 15 other riders from the early breakaway group beating Raleigh's James Stewart and Grant Bayton of the Wilier Big Maggys racing team. The race started in bright sunshine but freezing temperatures from Olveston Sports & Social Club at Old Down, Olveston, with a field of 80 riders taking on10 laps of the 6.6 mile circuit which includes the tough Old Down Hill. The eventual winner, Phil Sykes, got away early with local rider Andrew Magnier (Cycle Premier Metaltek), but the bunch soon pulled them back after Sykes had won the first prime up Old Down Hill. The winning break of 19 riders formed on the second lap and included last years winner, Marcin Bialoblocki (Wilier Big Maggys RT) as well as the Bristol Road Club rider Steve Thomas, undoubtedly the strongest 3rd Cat rider and riding the event for the 24th successive year. However Bialoblocki was unlucky to puncture and although managing to get back into contention after taking a teammates wheel, he then punctured again. Another unlucky rider was Richard Tanguy (Pendragon Colnago) the strongest climber in the break and "King of The Mountains" winner, who punctured on lap 8, but managed to borrow a wheel from a marshal to get him back to his team car at the start, eventually finishing last and so also winning the less glamorous Lanterne Rouge. 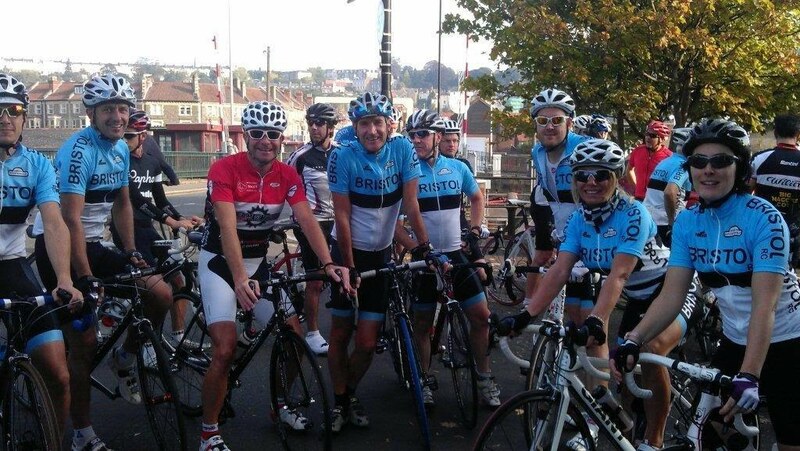 This Bristol Road Club event is one of the country's top and longest running early season road race events that dates back to the '60s when it was organised by the late Jack Turner. Like a lot of races, this event has used different circuits over the years with the current one of six miles just outside Bristol being used for the last 20 years. James Stewart of Raleigh and Grant Bayton of Wilier Big Maggys. the rest of the break behind, and with the iconic Severn Bridge in the background. Bristol RC rider, Steve Thomas, in the winning break. Local rider, Ben Luckwell of Wilier Big Maggys RT (red/black helmet) in the chasing bunch. The bunch all together early in the race. Chasing group in the closing stages, with Cycle Premier Metaltek to the fore.